In line with JAM’s vision of Helping Africa help itself our programmes are built to provide sustainable assistance for our beneficiaries across the African continent. Our programmes are built on the Complete Community Development Approach (CCDA), which ensures that we operate sustainable programmes that not only meet individuals immediate needs but also change the landscape of the community, leaving permanent and sustainable transformation. Our programmes include Feeding, General Food Distribution, Water and Sanitation, Livelihood Support and Agricultural Development. We are reaching and impacting the lives of millions of people in remote communities in Africa. We are committed to the development of children. For a child to succeed and have a progressive futrure they need to be well educated. The quality of their education can only be assured if they have sufficient nutrition for body and mind. 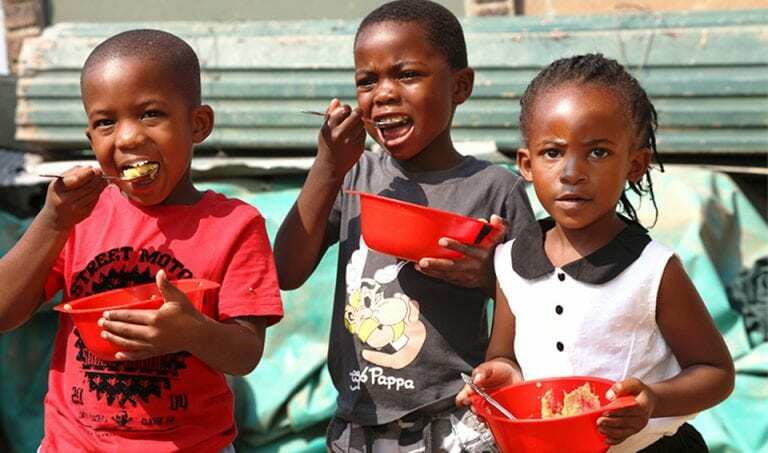 School Feeding programmes are effective in addressing school enrollment, particularly of the girl child, and improving the health of the children attending . By providing food at school we are giving children the nutrition that they need to concentrate in lessons and develop scholastically. With most of the world’s uncultivated arable land found in Sub-Saharan Africa, there is room for agriculture to expand. Developing the broad agricultural sector is key to its future because agricultural development programmes generate jobs, incomes and food. JAM is in the process of expanding a range of agricultural development activities alongside our existing school feeding programmes. Our agricultural targets involve our FEED Cycle (Farm, Empower, Enhance and Distribute), which incorporate both school feeding and agricultural development activities as a holistic set of programming. Generally African women and children walk for hours to collect water every day. The walk often puts them at risk of being attcaked, and the water that they collect is often dirty and unsafe. The lack of safe drinking water in their communities often keeps children from school or stops parents from being able to invest their time in activities that could earn them some money. Most schools do not have access to clean water and it affects the students and teachers at the school. JAM drills for water to meet immediate needs and to enable development. We own and operate our own drilling rigs with technical staff to ensure that our wells are sustainable. With every well that we drill or rehabilitate we provide Health and Sanitation training to the community. Thousands of African children in Africa endure extreme socio-economic conditions. This demands greater care for vulnerable children. One of JAM’s first programmes, in 1986, established an orphanage for 300 Mozambican children and reintegrated almost all of the children into the community. The facility is now a skills training centre. JAM’s child care efforts are concentrated in South Africa and Angola. In South Africa, JAM South Africa (JAM SA) supports more than 90 000 children in more than 1 700 child care centres in impoverished communities throughout South Africa. The objective of our school makeovers is to improve educational infrastructure creating a safe and stimulating environment for children to learn. In Mozambique particularly, access to water provision and agricultural training is also a specific focus. The scale and scope of school makeovers, or upgrades, depends on the budget available for each project. Teams from all over the world take on the challenge and raise the funds for a designated school upgrade. Participants are accommodated at JAM’s facilities and travel to the school each day to complete the upgrade within seven to 10 days. JAM’s headquarters in Johannesburg is well equipped to accommodate and cater for groups of up to 17 people. The JAM Rwanda Training Centre, formerly the Fred Nkindla Life Centre, was established in 1998 to house and re-integrate Rwandan genocide orphans back into their communities. Our orphanage transitioned into a vocational training centre with over 150 students to provide relevant training for sustainable futures!